Tri Counties Bank has started the Camp Fire Fund 2018 account with an initial deposit of $25,000 to benefit victims of the fires ravaging our communities in the Paradise, California area. Those who would like to make monetary donations to the Camp Fire Fund 2018 can at any Tri Counties Bank Branch or they can make a donation online. On behalf of Tri Counties Bank, we are truly humbled by the outpouring of generosity from our communities to assist victims of the ongoing Camp Fire in the Paradise, California area. We thank you and commit to being good stewards of your money to assist victims of this tremendous firestorm which is still an active emergency situation. All funds collected will be distributed to people in need through the United Way of Northern California, The Salvation Army, and Northern Valley Catholic Social Services. As of November 15, combined donations to the Tri Counties Bank Camp Fire Fund (in branch and through GoFundMe) total $1.5 million. This includes a generous $1 million donation from the Lytton Rancheria Tribe, which we are incredibly thankful for. We would also like to thank Radio Paradise for helping our fund to go international, with donations from counties including Switzerland, Germany and Australia. 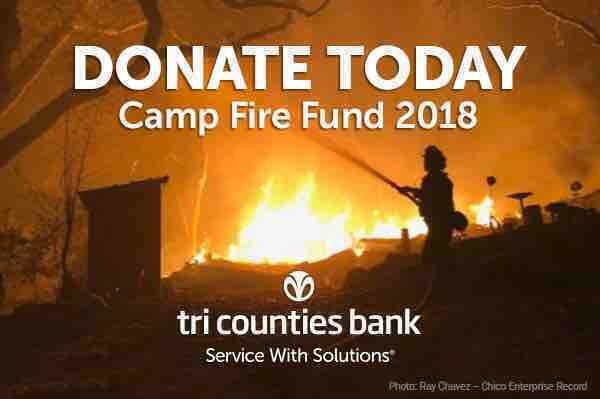 Those who would like to make monetary donations to the Camp Fire Fund 2018 can continue to do so at any Tri Counties Bank Branch or online at https://www.gofundme.com/tcb-2018-camp-fire-fund.